Lydia Lousteaux discusses everything astronomy-related with an experienced amateur observer and astrophotographer who has built his own observatory from the ground up using recycled materials and rebuilt a With-Browning antique telescope, all the while contributing on our forum: Mr. Barry Armstead. Barry, we all are interested in hearing about your With-Browning Telescope dating from 1878. Well Lydia, it's not actually mine. 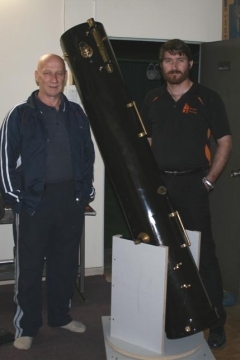 A couple of years ago I met a really nice bloke named Ron on an astronomy forum. He wanted to get into astronomy and needed a few things to help him on his way. Sounds like an excellent start toward a new friendship! Indeed it was! One day, a friend of Ron's gave him some old brass bits of an unidentified telescope. I had just built something for Ron and when I went up to Sydney to deliver it he entrusted me with the historic pieces. We worked together; I would ask questions about materials, dimensions etc., and Ron would do the research. So your friend Ron did a lot of the research and footwork on this and you took care of the handiwork? A lot was educated guesswork as we knew the period as the late 18th century, and I applied some fabrication techniques I knew to exist around then. How did you find the information to complete the work? Much was gleaned from old chinagraph drawings, sketches, newspaper articles, letters and photographs from owners of the few With-Brown Telescopes left in the world. Did you find any blueprints for the With-Browning? There were no blueprints so we did the best we could with whatever information we could get. You replied to one of our Astronomy Today Forum members on the possibility of rebuilding ‘scopes as a lucrative hobby. I wouldn't think this could be lucrative, due to the expense involved. Rewarding would be a better word, as well as frustrating, but all worth it. It sounds like you are quite adept at building things. Did you have this talent as a youngster? Personally, I am not a "qualified" machinist. Yes, I have been building things since I was a child out of all manner of materials, particularly metal. Over the years I have gained a wealth of knowledge and experience using whatever tooling and materials I could get my hands on. This old telescope has not only provided me with a diverse range of shapes and materials to achieve, but has taught me so much about how it used to be done. So many old techniques have been lost to modern automation. Is the rebuilt With-Browning now part of your personal collection? No, unfortunately not. It's a love job and I don't get to keep the scope. However, the journey over the last two years has been enriching. I feel immensely satisfied as it was like trying to build a car, starting with an old radiator cap, with no details on what sort of car it was but trying to build it with minimal information, with no trips to the spare parts shop. Wow! You are truly talented, Barry. When did you start thinking about building your observatory? Thanks for the compliment, Lydia. As far as the observatory history is concerned, I came back from a tour in East Timor (I was in the Army) all "cashed up" and wanting to spend my money. One telescope led to another and it wasn't very long before I wanted more and more. An observatory was inevitable. 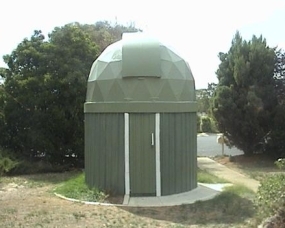 About a year before I purchased a home in Canberra, I spotted a couple of home built observatories in the U.S. and Australia that got me thinking and planning. So you were "hooked" on the idea since your Army days! You mentioned you used recycled materials for construction! Yes, once I had my own home and a job in a transport company, it was on! Having access to a great deal of wood, plastic and metal packaging used in freight and distribution, and my employers only too happy for me to remove it I immediately went into "scrounge mode", looking for anything that could be recycled before going to landfill. A year later after what I think was much help from The Big Fellow upstairs, the observatory was finished, built mostly of recycled materials! Yes, we appreciate your chronicles of this long, but fruitful process on our Astronomy Today Forum. Contributing to the health of our Good Earth through recycling materials into something positive for astronomy outreach is also brilliant. Well, you know, Lydia, building something useful on a cloudy night provides motivation and satisfaction. We thank Barry and his friend Ron for their contribution to Astronomy. Barry informs me that at this time he is building a new workshop and is working on a large scale wood model of the Starship Enterprise B. He has also built paper model spacecraft to adorn his observatory. We look forward to more book reviews and postings from Barry on Astronomy Today.